US blue chip index broke barrier on solid corporate earnings and Trump's greenlighting of controversial projects. The Dow Jones Industrial Average (DJIA) surged past a historic 20,000 points mark on Wednesday (25 January), on strong earnings data from major constituents and US President Donald Trump's reaffirmation of his pro natural resources stance which sent related stocks higher both overnight and in early trading. At 2:46pm GMT, the DJIA was 0.48% or 96.08 points higher at 20,008.79 points, having jumped to 20,033 at the opening bell. The index now stands at over three times the low it reached in March 2009, when it traded just above 6,600 points in the aftermath of the global financial crisis. The rally was led by Alcoa (+1.48%) after it posted an upbeat forecast, in tandem with Boeing (+2.68%) which unveiled better-than-expected earnings in the final quarter of the year. Furthermore, US automakers were among pre-market risers, adding to Tuesday's gains after Trump told bosses of the car manufacturers he will work to ease environmental regulations and "cut corporate taxes." The new occupant of the White House also sent resource stocks higher overnight after he backed the construction of the controversial Keystone XL and Dakota Access pipelines, provided "American steel" is used in both projects. The US blue chip index approached the 20,000 mark in December for the first time in its history, but breaching it proved elusive during the festive period and early in the New Year, before a flurry of positive vibes from constituents and Trump's pro-energy sector stance finally ferried it over the line during Wednesday's trading. Neil Wilson, senior market analyst at ETX Capital, said: "Something like $3 trillion has been pulled from bonds and $3 trillion pumped into equities. President Trump is bound to take credit for the rally, and he may well be justified to some degree. "Animal spirits have been unleashed. 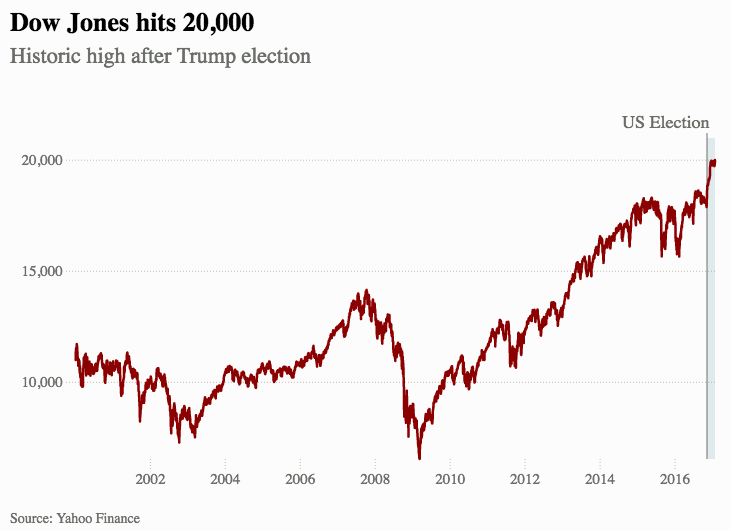 US indices are rocking all-time highs and the Dow has finally smashed 20,000 after rising 10% since the election in early November. The question now is how long can this last?" 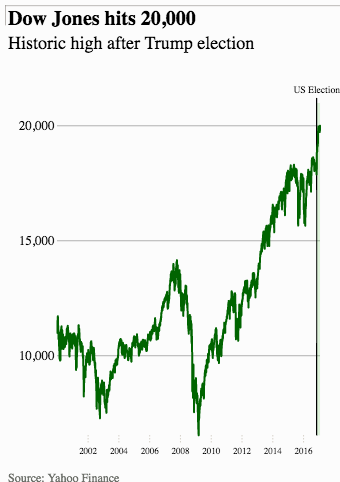 Laith Khalaf, senior analyst at Hargreaves Lansdown said the 'Trump jump' has propelled the Dow to an unprecedented level, as investors pile into US stocks in anticipation of lower corporate taxes and more government spending. "Meanwhile, expectations of further interest rate rises in the US, and the potential for inflationary fiscal stimulus, has been putting upward pressure on bond-yields in the last few months." Khalaf added that the Dow may well be at record highs, however when the earnings generated by companies on the market are factored in, stock valuations show neither the extreme pessimism of 2008, nor the irrational exuberance of 1999. "This means they are trading somewhere in the middle of their range, so are neither exceptionally cheap or hideously expensive."